As an alternative, working goldsmiths tend to use other cutting tools. Some use separating discs, but these cut ragged edges and tend to create a lot of heat. A superfine separating disc works better, but it is hard to have complete control over the procedure. 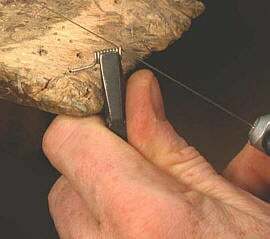 As a result, most goldsmiths use jewelers’ saws, which are slower and more controllable. In addition to a jeweler’s saw, there are a number of tools and methods you can use to cut jump rings, including the following. When I make jump rings, I wind a short section at a time and saw off the rings by hand, using the bench pin for support. If the section is long and a little wobbly, I hold it as shown on the left of figure 1; if it’s short and stiff enough, I hold it as shown on the right. In both cases, the coiled rings catch onto the little wooden nub that I shaped into the bench pin. In addition to holding the coil in your hand, you can use a pair of self-locking pliers. I filed a rounded groove into each side of the jaws. The jump ring coil fits in the grooves, allowing you to hold it securely while cutting. There are several tools designed for cutting piles of jump rings. The Jump Ringer and the Koil Cutter by Dave Arens of Tucson are systems designed for the mass production of jump rings. Both use a flex-shaft attachment to create a contained circular saw blade. Clamped jump rings on mandrels are fed onto the tools for cutting. I learned an old-fashioned method of cutting jump rings en masse from Christian Gaudernak of Søn , Norway . Take a round steel rod and saw a thin slit into the end (figure 2). Solder a razor blade or matte knife blade so it protrudes 1 to 2 mm from the surface of the rod. Grind off any excess material from the blade. Position a draw plate so it is backwards to how you would normally use it. Pull the rod with the wound jump ring coil on it through a draw plate hole of corresponding size. The draw plate presses the wound rings onto the blade, which cuts them.